Betty is a Buffalo, New York, native who acts, writes and adventures. She's currently polishing a one-woman show portraying the late sculptress Louise Nevelson, writing a children's book and cuddling a new printer. The perpetrators of this British tour-de-mouse are programmer Ian Murray-Watson and graphics designer Pete Lyon. Their inspiration came from the old saying: "A million kittens with a million balls of yarn will eventually knit an Aran sweater." When the kittens refused to cooperate, Pete and Ian looked at the mess and said, "By Jove! We've discovered Tanglewood!" Finding your way through the intricacies of this tangled yarn is almost impossible because it starts at an unreasonably difficult level. There is no "easing" into the game, no cheap victories. You're just there, trying to figure out what in the name of Zork you're supposed to do. The 16-page manual gives you a skeleton of information that you must flesh out through experimentation and experience. What you don't know does hurt you. But you're gonna love the pain! The scene: a small undistinguished planet called Tanglewood. Actually, its name is "T'ng-y-wd", which can only be pronounced by its native T'nglians and Pete. The time: a century or two hence. There is no "easing" into the game, no cheap victories. You're just there, trying to figure out what in the name off Zork you're supposed to do. The story: Uncle Arthur is being sued by the crooked company that sold him the mining rights to Tanglewood. Accidentally, he has discovered some militarily valuable stones called Dog Crystals, and there are rumors of Ice Emeralds that have untold commercial applications. Now the company wants its rights back, and Uncle Arthur is in the soup. He enlists your aid, with your computer expertise, to go to Tanglewood and find the documents that prove his ownership of the mining rights. Trouble is, the equipment is antiquated, the opposition has set up defenses and the T'nglians are very strange beings. The court case comes up in ten days, so you'd better hurry up. The boot: (One-drive owners will have to switch disks occasionally. No big deal.) After the charming title screen, suddenly there is the control panel (before which you'll probably spend the rest of your life). One large action screen is surrounded by lights and dials and buttons and switches and gauges that do everything but dispense aspirin. All the utilities are available: save game, quite, restart, sound off, status, etc. There are five little windows on the right showing your mobile, the objects it's carrying and the object found. In general, left-button clicks "do" or "open" and right-button clicks give information about objects and other things. And there's a line gauge (top left) that indicates the passing of day to night and keeps track of the time. Tendays is all you're allowed, so don't use the Time Warp switch more times than you have to. You operate five radio-controlled mining mobiles, each with its own abilities and disabilities—including corrupt or missing data. Imagine the logistics of keeping track of five vehicles on a map the size of Wyoming! Incidentally mapping this game would traumatize Rand & McNally. The paths and rivers twist and turn viciously, and the mazes are deucedly devious. 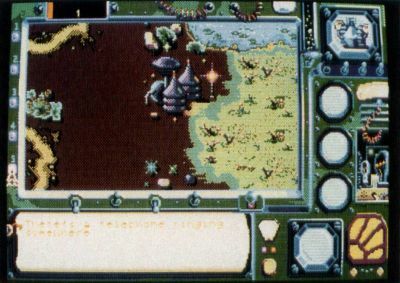 Terrains include lakes, swamps, caves, treetops, underwater areas, gardens, mines and the ominous Headquarters of the Opposition (to name a few). Maneuvering those little ATV's takes practice. The mouse movements must be as precise as a ballerina's. Once you've mastered this, the exuberance of the animation will amaze and enchant you. The mobiles have fronts, sides and rears—even little lights to show they're operating. They rickety-rackety around with a klutzy recklessness that's almost endearing. But they do run out of energy and get zapped by the opposition. Mobile #5, which has defense, can repair the others, if it can find them. Defense is the crucial word here. It won't spoil the game for you to know that Dog Crystals, properly inserted in each mobile, will provide protection. But where are they? And where is that library that identifies them? And where did you leave Mobile #3? Keep track! Tanglewood is a comparatively gentle game, with no monsters per se, and no killing or bloody mayhem. You find things. You figure out what to do with them. You explore. If you're lucky or extremely psychic, you'll surround the Headquarters of the Opposition, screw up its computer and retrieve the documents for Uncle Arthur. Some monitor hints: Although you can start unraveling puzzles anywhere, find Mobile #4 first, then find the aerial to make it operable. Find the Translation Data Disk and put it in Mobile #4. Now look around for more objects, even in litter cans. There's a lot to do before you get anywhere; but in this case, getting there is all the fun. Granted, this description is minimal. No mention has been made of the three moons: Neera, Fahtha and Furthera. Not a word about the Earthquake Zone or the Great Sage or the Church or the Teahouse, Boathouse or Walled Garden. Do you know about the rituals of the T'nglians? What about the subway and the matter transmitter? The telephone booths and the mine elevators? On and on the perplexity grows. Tanglewood is a great, sprawling, complex complex that utilizes 700K of graphics. It's all mouse, not one keyboard poke. The animation is faultless, smooth as this page; but it's the detail that'll knock your socks askew. If the colorful graphics don't get you, the multiple sound effects will. They're superb, from the underwater gurgles to the mobile motors. To paraphrase the wisdom of Bertrand Russell (or was it Steve Panak? ): "Computer adventuring, if it is to have any depth and solidity, demands a life built around some central purpose of a kind, demanding continuous activity and permitting of progressively increasing success." Tanglewood has depth. Go for it, and pray for a hint book.